Thread: The old English tradition of Baseball? Local historians in Surrey have confirmed evidence that baseball was played in the UK more than 20 years before American independence. 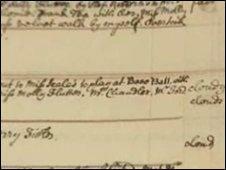 A diary that documents a game being played in Guildford in 1755 has been verified by Surrey History Centre. William Bray, a Surrey diarist and historian from Shere, wrote about the game when he was still a teenager. Major League Baseball, the governing body of the game in the US, has been informed of the discovery. Julian Pooley, Surrey History Centre manager and William Bray expert, said the diary showed the game was a well-established sport in the 18th Century and was played by men and women. Tricia St John Barry, who owns the diary, dug out the documents last year after watching a report on BBC South Today which said the sport began in the 1790s. William Bray lived from 1736 to 1832 and worked as a solicitor, a steward of Surrey manors and a Surrey historian. Mr Pooley said: "He kept lots and lots of diaries that we have in the Surrey History Centre but last year a new one was discovered in a garden shed and it contains his diary from 1754 to 1755. "It contains a reference to him playing baseball. What intrigued me is he is playing it with a load of young ladies." The diary states they had tea after the game on Easter Monday and also played cricket. Kevin Sullivan, the Washington Post's London bureau correspondent and an avid Boston Red Sox fan, told BBC Radio Four's Today Programme: "It's a great American tradition to take things from other places and improve them. "We've always known that baseball evolved - it wasn't invented like basketball." There was a later historical reference to the game being played in England in Jane Austen's Northanger Abbey, written between 1797 and 1798. Its still played today we call it rounders. Or softball for the special kids. So baseball is a based on a girls game afterall, good job that bloke kept a diary. It's still a girls game in the UK and also played in mixed schools up to the age of 11. Do our girls get to mix it in the "world series" ???? ?